The Shaken Encore theme is for the artist that prefers a minimalistic design approach without compromising on key features. Because of its minimalist nature, it works for a wide variety of musicians and like all the themes built on the AudioTheme framework, it supports gigs, discography, and videos in addition to the features found in typical WordPress themes. 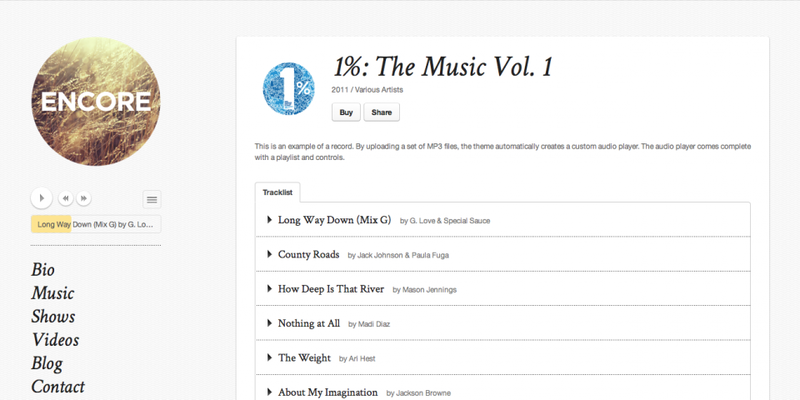 Create a playlist with a custom audio player on the fly and feature it in your site’s sidebar. Well-chosen fonts and optimized line-lengths make reading blog posts a breeze. Social Bartender plugin integration. Social icons will display above the footer text. Get all of our music themes and plugins for one low price. Perfect for bands, solo musicians, songwriters, and anyone that manages websites for people who make music.